When I’m putting on long johns and an old down coat the chickens are shedding their feathers. It seems odd that when the weather gets colder and the days shorter the chickens often decide it is time to molt. Molting is the process in which the chickens loose their feathers and to only grow back new feathers. During the molting process chickens cease to lay eggs as their energy needs to go into the process of growing new feathers. In our coops we use hanging feeders for the cracked grains. At the top of the feeder is a large round opening large enough for a chicken to jump into. We currently have one molting almost featherless chicken with a few stubbly new feathers starting to grow. Each day when I go to the coop she is in the feeder. Her head peaks out as if she is totally embarrassed by her appearance but still wants to see what is going on. I haven’t noticed any of the other chickens cackling at her or teasing her, although I’m not watching them every minute. Maybe as the cooler air whips through the coop she could be donning the feeder just to stay warm. Most likely she probably has massive cravings for the proteins in the grain and is trying to hog all the feed for herself as she needs to speed up the new feather growth before the snow flies. For us humans the most ironic part of this scenario is that we want to start getting cozy in our houses and do more baking. We want to fill the house with wonderful aromas and sweet treats. As farmers we want to be able to provide those eggs. We all want more eggs from the same chickens that are hiding in the feeders refusing to come out and lay eggs. Dale who was raised on a dairy farm swears that the cows when listening to rock & roll gave more milk. I’m considering resorting to playing music for them to convince them to grow feathers faster and lay eggs. I’m not sure what music the chickens like if any. Next year I may even resort to freezing the bugs I catch during the summer to give them more protein. For now we will just wait for the chickens to grow back new feathers and hope they start laying eggs again. Fresh or dried flowers can stand alone as an herbal tea. They blend well with cake, cookies, muffins jellies, black tea, fruit and eggs but the key is to use it sparingly. The taste will be soapy if you use too much. The leaves can be used anywhere you use the flowers SPARINGLY and fresh. If you cook the leaves they may turn bitter. I make an awesome vinegar by filling a jar with the leaves, covering with vinegar and waiting for at least a month, the longer the better. Strain out the leaves and use the vinegar in a fruit drink or salad dressing. For a great salad dressing using fresh flowers look in the recipe section for Lavender and Honey Salad Dressing. What to do with Basil. Basil has been used for more than 2,000 years in medicine, spiritual ceremonies and of course cooking. One medicinal variety originating in India is actually a 6 foot tree with 7 inch leaves. To make things even more confusing, varieties with the same name but from different countries, may be totally different. The first mention of culinary basil was written by the poet Virgil around 19 BC. when he spoke of Pesto. What to do with Basil? Make Pesto. Think of it as ancient convenience food. You can find a basic pesto recipe under the recipe tab and a fantastic chicken vegetable soup with basil pesto recipe here along with a few suggestions for more uses. Heat oil in Dutch oven over med-high heat. Cook onion about 5 minutes. Add garlic, cook 1 minute. Add water, carrot, broth and potatoes; cover and simmer 15 minutes. Add remaining ingredients and cook until heated through. Sweet potatoes are not potatoes but are a member of the morning glory family. A dense source of nutrition that is largely overlooked in the United States. We eat less than five pounds per person a year. Unlike white potatoes, sweet potatoes are loaded with complex carbs- the same variety you find in whole grains- and they lower the risk of heart disease and diabetes according to Harvard Medical School. They also contain large amounts of Vitamin A and Manganese, which is necessary for brain function. The smaller the sweet potato the sweeter it is and they can be substituted for white potatoes in any recipe. Cook on medium heat stirring occasionally. Sweet potatoes should be al dente. Anita Heeke is the owner of Pineberry Dairy which is in Silverwood Mich. She is a fourth generation farmer and has always been active with 4-H. If you were to go on her farm you would find a variety of animals from goats to heritage turkeys and even a house trained potbellied pig that shares a bed with the dog, great entertainment and NOT FOOD. Anita is crafty and likes to make soaps and lotions from the milk she gets from the goats. She also makes hand twined rugs with recycled fabrics, she has given many demonstrations on this technique. 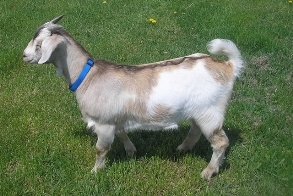 Currently she has been blessed with two big beautiful Overhasli goat bucks and will now be able to increase her herd with this unique Swiss Heritage bread. You can look forward to more products from Anita on the website. We are very grateful to have her back. 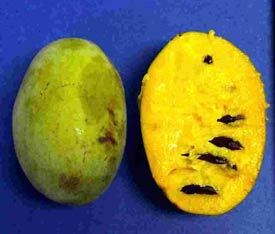 Pawpaws are native to Michigan and they are the closest thing we have to a tropical banana. They produce a tasty sweet-smelling flesh that is like a blend of bananas, papaya, mango and pineapple. My attempts to plant them in our woods failed. Fortunately when in season this unique fruit can be found at some farmers markets. One day while visiting a Michigan farmers market I was surprised to find long yellow bananas that are not native to Michigan. Although I know that with season extensions and creativity some people can grow amazing crops in their hoop houses. On our farm I haphazardly experienced some banana tree growing. Like many farms that were once generational farms we have two houses. Since we can’t live in both of them simultaneously we rent one house out and live in the other. It never occurred to me that there was ever a slight possibility to be able to grow bananas, nor did I ever consider how much it would cost to grow bananas until my new neighbors from the South came with a fine specimen of a banana tree. Winter came and without my knowledge the banana tree sat cozy in their garage staying warm with electric heaters. I only learned of the cozy trees lifestyle when I received the ever so unexpectedly large electric bill. I now have some assemblance of how much one locally grown banana would cost at a Michigan Farmers Market. I will first have to get a second mortgage before I will be able to afford one. Until than I will stick with the Pawpaws. The word “oregano” is Greek for “delight of the mountains”, where it grows wild in many forms. True Greek oregano has a spicey aroma with notes of peppermint, pine and clove. It became popular in the U.S. when returning servicemen brought it along with them in the 1940’s. Pizza is the dish mostly associated with oregano and it is currently the most commonly purchased spice in the U.S. It is used medicinally for its antioxidant properties, both the flowers and the leaves can be used to make tea. Combine all in a saucepan. Bring to a boil and simmer for 20 minutes stirring occasionally. Adjust salt and add a small amount of sugar if the tomatoes were acidic. Use as is or puree. Garden produce that is not fit to sell is often food for the chickens. They are often fussy eaters and will snub their beaks to some things and devour others. Some of the younger chickens have not yet learned to fully appreciate tomatoes. They can be big red and they roll. As I walk by the young chickens they all get excited and run along their movable pens waiting for me to throw something to them. Last week they got tomatoes for the first time. They ran to the tomatoes that splashed and dug right in. Not all the tomatoes smashed, some of them rolled a little. They still ran to those ones and took a bite. When they bit the round tomato, it rolled back at them as in self defense. The young chickens JUMPED HIGH and ran. With hesitation they attacked the tomato again, ran away from the tomato again until the tomato tired and stopped rolling. When they won the attack they fully devoured the tomatoes.